Kiswahili the whale shark is called “papa shillingi”, translating as “shark covered in shillings”. There is a local legend that God was so pleased when he created this beautiful fish, that he gave his angels handfuls of gold and silver coins to throw down from heaven onto its back. So it goes that whale sharks have their magical markings and swim near the surface, catching the sun on their backs, as a way of saying thank you to their maker. Whale sharks have called Kenyan waters home for many years. Recently, there has been a significant increase which is perhaps related to the post El Nino mantis shrimp invasion. The increase in whale sharks along the Kenyan coast has meant that they have become more of a target. Under international law, whale sharks are only given a secondary type of protection. They are listed under CITES Appendix II meaning that trade in whale sharks is allowed but must be monitored. Although relatively little is known about the biggest fish in the ocean, most specialists will agree that this level of protection is not enough. The overall aim of many whale shark projects is to raise awareness so that the level of protection afforded to whale shark is increased. The more we know about whale sharks the easier it will be to review the level of protection. The EAWST aims to provide a research centre for collecting and analyzing data on the local whale shark population, its habits and movements. The Trust works closely with other regional organizations because whale sharks are migratory. The whale shark is the largest fish in the world, measuring up to 18 metres and weigh up to 20 tons. It feeds on platonic creatures and small fish, and has only tiny teeth. Like all sharks, it is cartilaginous rather than bony. It is easily identified by its huge size, many spots, and flattish front end. It can be found in tropical waters worldwide, and is sought after by divers visiting Ningaloo Reef in Australia, the Burma Banks near Thailand, on the south coast of the Kenyan reef and remote islands in the eastern Pacific such as Isla del Coco (Costa Rica) and the Galapagos archipelago (Ecuador). It is generally considered not to be a threat to swimmers and divers. In some parts of the world it is well protected, while in some areas of Malaysia and Indonesia it is hunted (harpooned) for its fins and meat. Whale sharks give birth to live young – recently a pregnant female was harpooned bearing 300 embryos of which 15 were alive. How should I approach one? Even though whale sharks are passive and gentle creatures, it is important to remember certain rules when interacting with them. 1. Never touch the sharks. 2. Maintain minimum distances as shown on the accompanying illustration:4 metres from the tail and 3 meters from the head and body. 3. Avoid flash photography and underwater scooters. 4. Limit interaction time to 30 minutes for a single shark and total interaction time to 1 hour. It’s important to follow these rules, both for your own sake and for the sharks. If these rules are broken, the shark is likely to become annoyed and engage in defensive behaviour. Defensive behaviour includes: Eye rolling Banking Diving Tail-slapping A shark that does not exhibit any of these behaviours is likely to stay in the area for much longer. If the shark continues to feed while there are divers in the water, this is the best sign that the shark is not bothered. It is also an amazing photo-opportunity! Volker Bassen, founder of the EAWST and co-owner of our dive center has set up 18 dive centers since his arrival in Kenya 1990. With more than 5000 dives under his belt he has vast experience and feel for how a professional dive center should operate. We also offer a volunteer program which focuses on marine conservation. Our volunteers actively participate in scuba diving training, whale shark research, coral growing/transplant, turtle/dolphin identification as well as many land-based community projects were we support local schools and an orphanage. We are the only dive center in Kenya that do weekly beach clean-ups with the help of school children and orphans, this takes place every Saturday throughout the year. Last year we collected 10 tons of plastic! 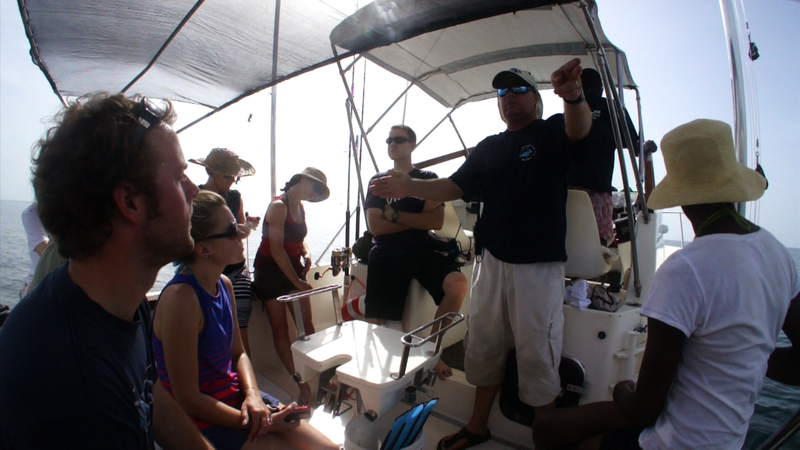 Of course we also invite our clients to participate in our different marine conservation seminars after dives. Whale Shark Adventures is located @ Watano House premises, right in the center of Diani beach, voted ‘Africa’s Premier Beach Destination 3 times in a row by the World Tourist Association.